I have been experimenting with a few things in the last few weeks, but work had caught up with me and I haven’t made a chance to sit down and write about my efforts. I have also been busy mourning the end of the only TV show I religiously watch, the Great British Bake Off. Content with the finalists and the winner, I have been inspired to try a few different recipes, so I guess there is a happy ending after all. 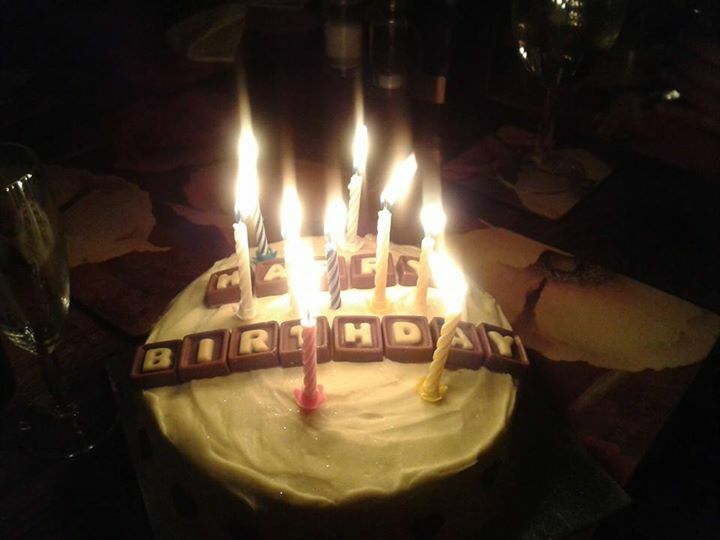 Whilst my chocolate cake for my friend Vic’s birthday turned out alright, I did fail on an adapted version of Mary Berry’s spiced orange cake. 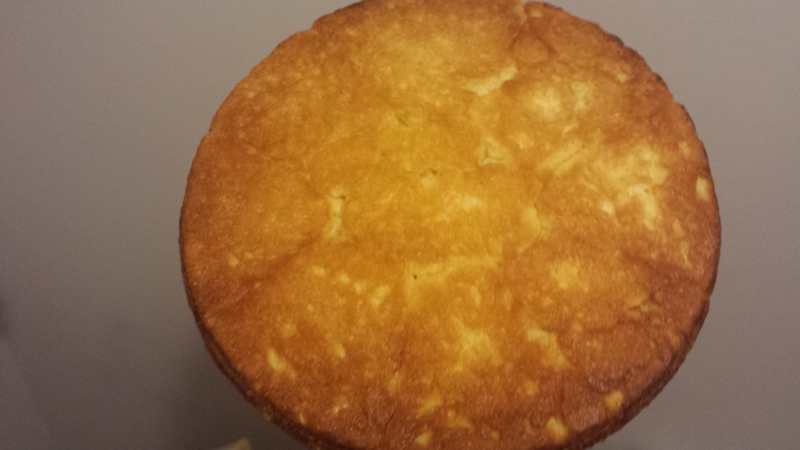 Pulverised lemon in a cake does NOT taste nice. 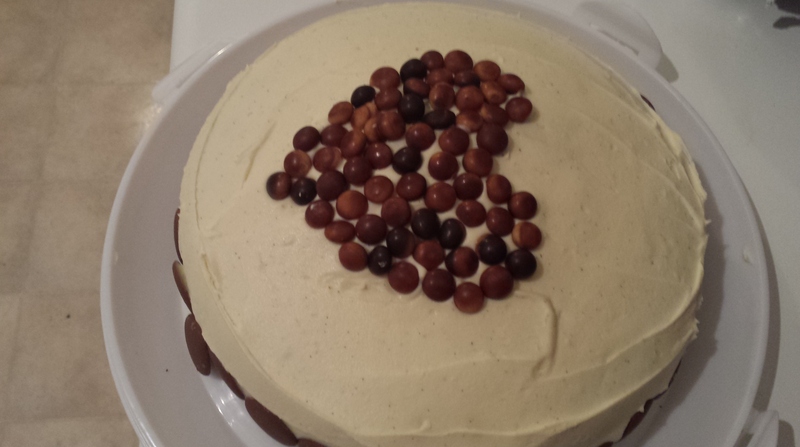 However I would say that I have perfected my white chocolate icing recipe. I made another chocolate birthday cake, another Mary Berry recipe and added fresh raspberries and white chocolate chips to the batter. I have already had a re-order for next year so that must be good feedback! In a somewhat less successful episode, I couldn’t even bring myself to take a photo of my failed macarons. What have previously been such beautiful treats were reduced to burned splodges after trying to rush through the 36 steps of making macaron shells, according to the master Mr Herme. I will try again, hopefully once in possession of a sugar thermometer, and will report back on progress. Passion will prevail over precision! 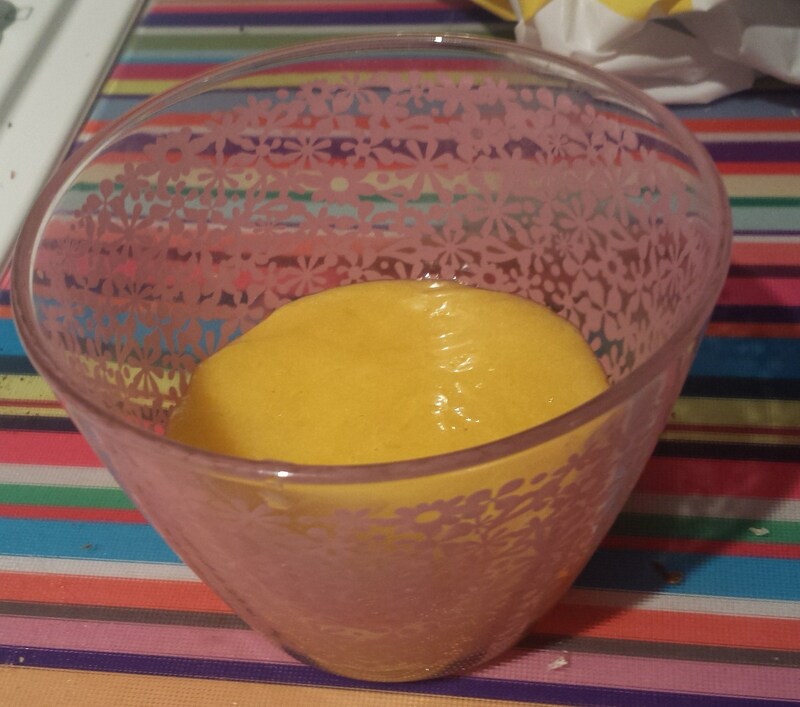 Inspired by my friend Sally’s delicious macarons (which were never a failure), and in anticipation of warm, fresh brioche, I had a go at making some lemon curd. I also had a lot of egg yolks and lemons to use up after the above failures. I followed Delia’s lemon curd recipe and as usual, her words of wisdom are right on the mark. Zingy lemon curd with just the right tinge of sweetness was ready to be slathered on to brioche. 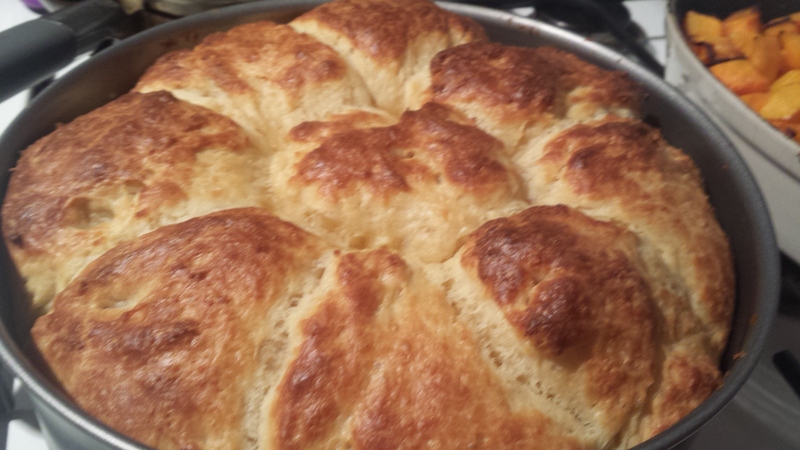 Moving on to the main subject of this post, Bronya’s brioches. Bronya is Jess’s mum (see “a bit of savoury on the side” for cooking adventures with Jess). As teenagers, she was picking Jess and I up in the early hours of the morning after a night out and bringing us tea and toast in bed the next day. As adults, she is sharing her delicious bread recipes with us. This recipe makes makes one large loaf, which can be shaped to make it easy to share. It has a crisp, sugary coating and soft, fluffy, buttery middle. Yum! 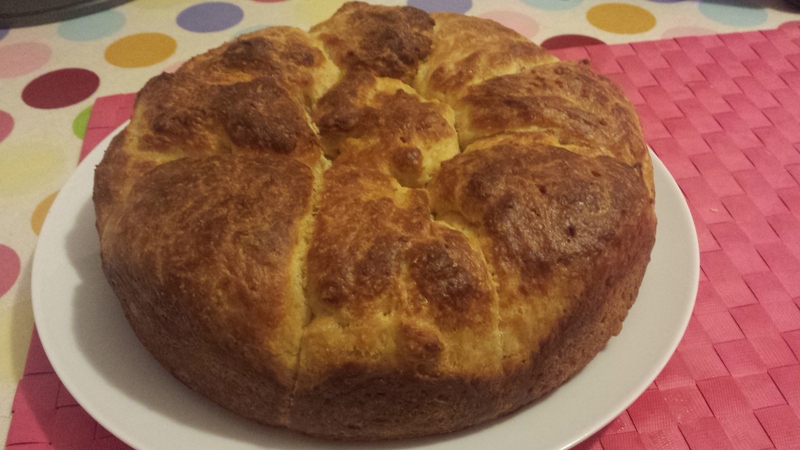 I was so proud of my loaf, no soggy bottom (GBBO reference) and it tasted delicious. Just a little forward planning is required as you need to assemble the dough the night before baking it. Bronya’s recipe is below, unadulterated and with full credit to her. Delicious served warm with lemon curd or another spread of your choice. 1. Put the flour into the bowl of a mixer fitted with a dough hook. 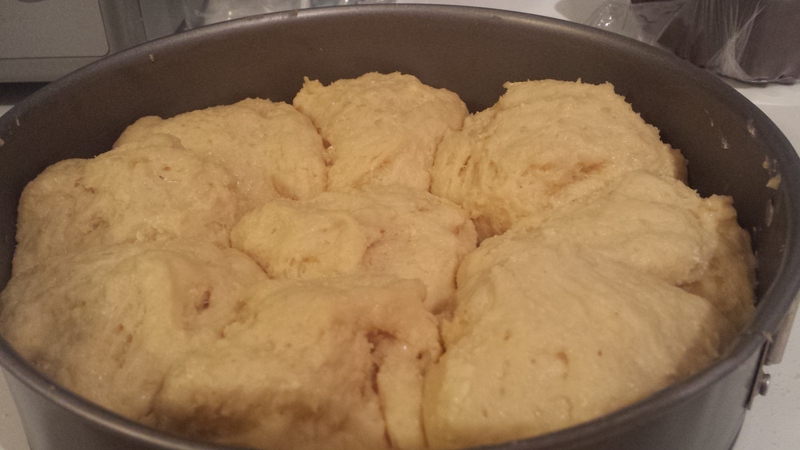 Add the salt and sugar to one side of the bowl and the yeast to the other. Add the milk and eggs and mix on a slow speed for 2 minutes, then on a medium speed for a further 6–8 minutes, until you have a soft, glossy, elastic dough. Add the softened butter and continue to mix for a further 4–5 minutes, scraping down the bowl periodically to ensure that the butter is thoroughly incorporated. The dough should be very soft. 2. Tip the dough into a plastic bowl, cover and chill overnight or for at least 7 hours, until it is firm and you are able to shape it. 4. Take your brioche dough from the fridge and tip it onto a lightly floured surface and fold it in on itself a few times to knock out the air. Divide it into 9 equal pieces. Shape each piece into a smooth ball by placing it into a cage formed by your hand and the table and moving your hand around in a circular motion, rotating the ball rapidly. 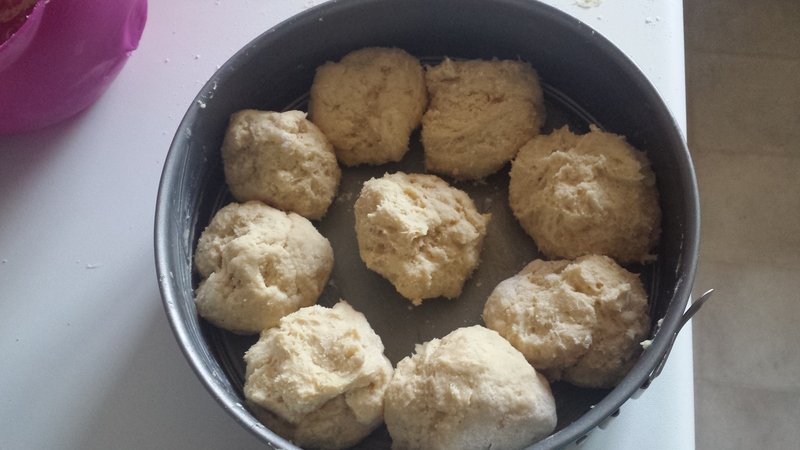 Put 8 balls of dough around the outside of the tin and the final one in the middle. 5. Cover with a clean plastic bag and leave to prove for 2–3 hours, or until the dough has risen to just above the rim of the tin. 7. When the brioche is proved, bake for 20–30 minutes or until a skewer inserted into the centre comes out clean. Bear in mind that the sugar and butter in the dough will make it take on colour before it is actually fully baked. 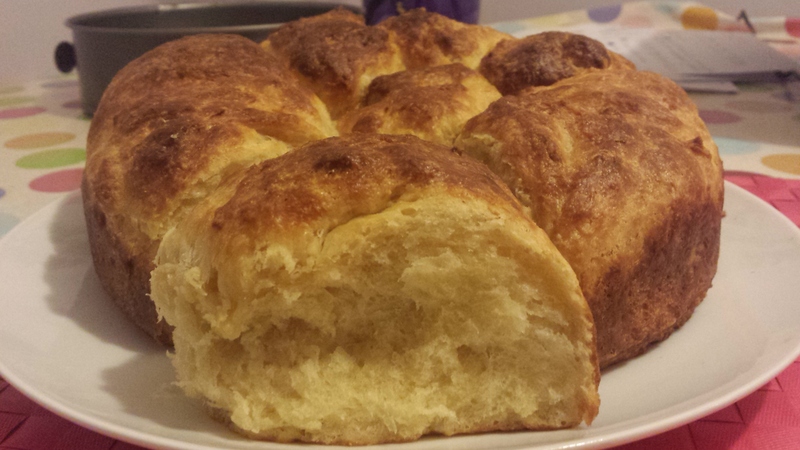 Remove the brioche from the tin and cool on a wire rack. Serve warm or at room temperature.